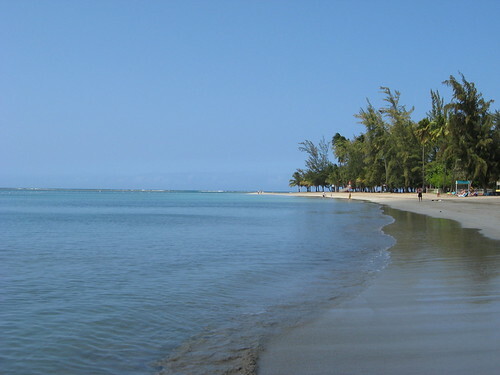 Luquillo Beach, originally uploaded by Craftydiddl. Again back home 🙂 as nice as it is to travel it is also nice to be back home. So we went to Puerto Rico to see my dad and all my family down there. A cousin of mine was getting married and my dad was the Best Man so i thought it would be a good reason to make my way down there. We had a really nice time. It was really nice seeing my dad, his wife and her daughters, aunts, cousins and their little ones and they got to meet my family as well. Its hard having all my family so far away and it makes us poor LOL so no more travels for awhile. We went to the beach, drove around the island and visited some places. Had some yummy food!! it was all a lot of fun. I started a new project yesterday and will be swatching for a third soon too but more on all that next time or i won’t have anything to talk about! Happy to be back-Hope you are all well! Some Knitting News tomorrow. « Socks and Short Vaca. I am sure it was very hard to leave PR and all of your fam!! AAAhhh! It is so fun to be away but just as nice to come home. The beach in your photo is beautiful! so glad you’re home! that beach is so beautiful but what i want to see is a picture of you in your fancy dress!